GRIPAJAR – Introducing a new invention for the kitchen – GRIPAJAR grips the jar so you don't have to! Introducing a new invention for the kitchen – GRIPAJAR grips the jar so you don't have to! Introducing a new invention for the kitchen - GRIPAJAR grips the jar so you don't have to! Have you ever experienced the frustration of trying to open a very tight jar lid? Perhaps you have arthritis or have young children whose hands are not strong enough to securely grip a large jar? My name is Romek Figa, and I have come out of retirement from computer programming to invent GRIPAJAR to solve these problems. GRIPAJAR harnesses the gripping power of a three jaw chuck to hold a jar in place. Then you simply grab the lid with one or both hands and spin it open! 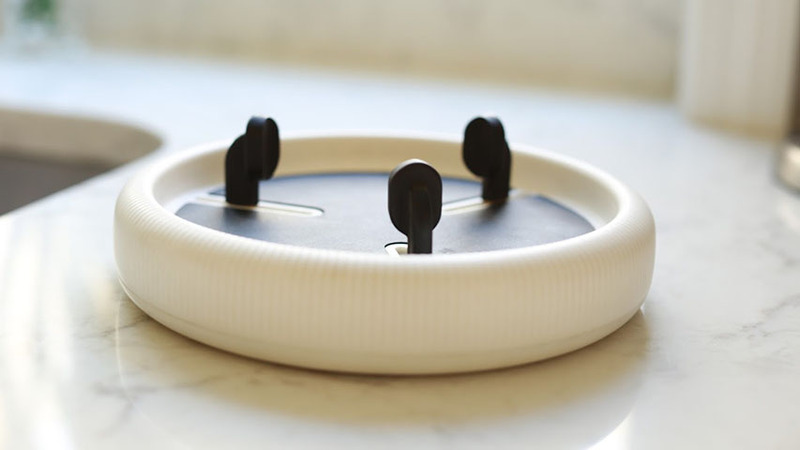 GRIPAJAR has rubber grips on the bottom to secure it to a table or counter top. WHEN WILL GRIPAJAR BE AVAILABLE? There is a patent pending on specific GRIPAJAR features. The current model is in a redesign phase to further enhance the gripping mechanisms and, if possible, also reduce manufacturing costs. The next step will be to forge a partnership with a manufacturer in the US to gear up for mass production. Please stay tuned to this website to see when and where GRIPAJAR will be available to you!